You analyze specimens in your work. Now it’s time to analyze a resume sample to get ideas for improving your medical lab technician resume. Just as you analyze specimen samples in your laboratory work, you should analyze resume samples to get ideas for improving your resume, says resume expert Kim Isaacs—especially if you want to land top lab technician jobs. To learn how your resume can emphasize procedural lab skills developed in a hospital setting, view this entry-level medical lab technician resume sample that Isaacs created below. 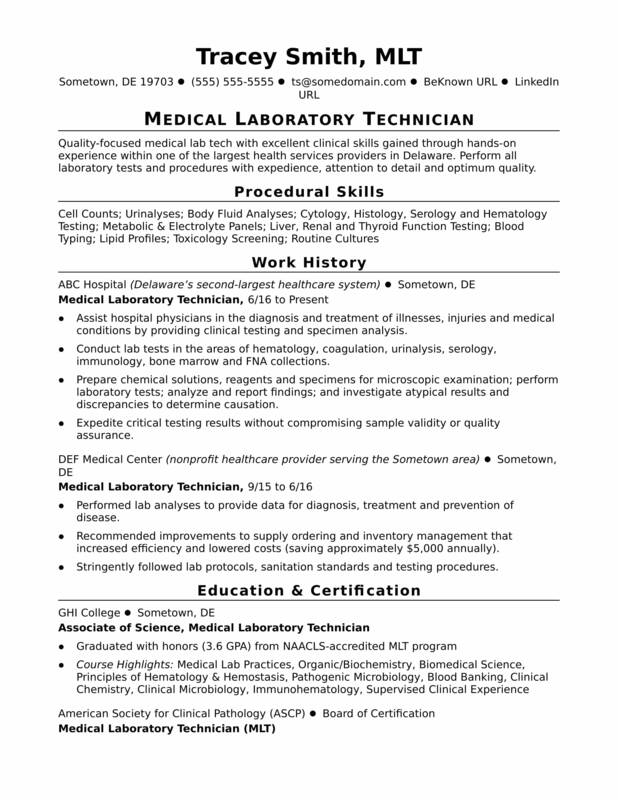 You can also download the entry-level medical lab technician resume template in Word. Quality-focused medical lab tech with excellent clinical skills gained through hands-on experience within one of the largest health services providers in Delaware. Perform all laboratory tests and procedures with expedience, attention to detail and optimum quality. Assist hospital physicians in the diagnosis and treatment of illnesses, injuries and medical conditions by providing clinical testing and specimen analysis. Conduct lab tests in the areas of hematology, coagulation, urinalysis, serology, immunology, bone marrow and FNA collections. Expedite critical testing results without compromising sample validity or quality assurance. Recommended improvements to supply ordering and inventory management that increased efficiency and lowered costs (saving approximately $5,000 annually). Stringently followed lab protocols, sanitation standards and testing procedures. As a lab tech, you're familiar with lots of tests and screenings, but odds are those can't be applied to your resume. Could you use a professional review to help your resume stand out from the crowd? Get a free resume evaluation today from the experts at Monster's Resume Writing Service. You'll get detailed feedback in two business days, including a review of your resume's appearance and content, and a prediction of a recruiter's first impression. Let the experts at Monster run their analysis and show you ways you can strengthen your chances of getting a great new job.